Vancouver, BC – Hafler (a division of Radial Engineering Ltd.) will be launching the Hafler CI series this spring. The CI series is a brand new range of multi-channel amplifiers designed for the custom installation market. 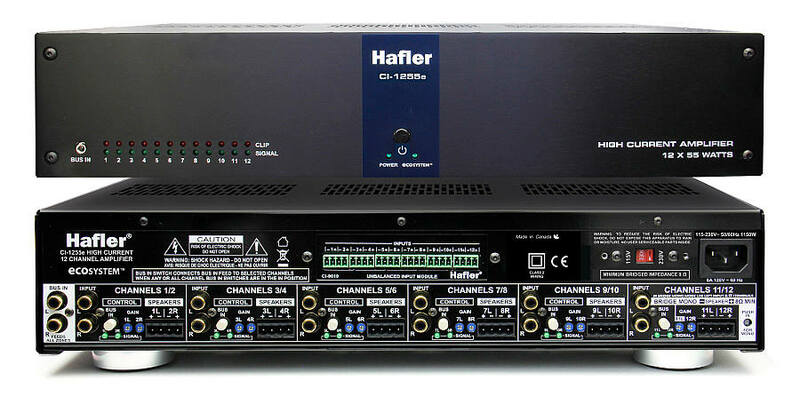 Hafler will be releasing three multi-zone amplifiers: the 6 channel CI-6120e™, the 8 channel CI-855e™ and the 12 channel CI-1255e™. Although all three amps are similar, they all have slightly different features. Common features include a compact footprint that is only 3.5″ (8.9 cm) high, 17″ (43.2 cm) wide and 11.5″ (29.2 cm) deep, RCA inputs and an all-channel bus input for easy routing. Class-AB circuit topology for the most demanding listening needs, Hush-Tone™ fan cooling technology, rear-panel level controls and signal status LEDs, and easy to use detachable Euroblock® (Phoenix style) speaker connectors for quick and secure termination. To save energy, all three amps are equipped with ecoSYSTEM™ – an innovative circuit that shuts the amp off when not in use after 1 minute, and automatically restarts individual amplifier channels in less than 10 milliseconds. The CI-6120e delivers 120 watts per channel to 3 stereo zones and is equipped with RCA throughputs and balanced detachable Euroblock connectors for greater connectivity options. The CI-855e delivers 55 watts per channel to 4 stereo zones and channels 7 and 8 may be bridged mono to power a subwoofer with over 120 watts at 8 Ohms. The CI-1255e also delivers 55 watts per channel but this time to 6 stereo zones and is equipped with the same bridge-mono functionality using channels 11 and 12. All three amplifiers are equipped with Omniport™ – a plug-in module that can be used to add various functions such as Euroblock connectors, Jensen-transformer isolated inputs, or a Dante® digital networking card to connect the Hafler amp to an Ethernet hub. Power may be derived from either a 115V or a 230V supply via the internal dual-tap toroidal transformer to accommodate installations around the globe. The CI series is expected to start shipping spring 2017.